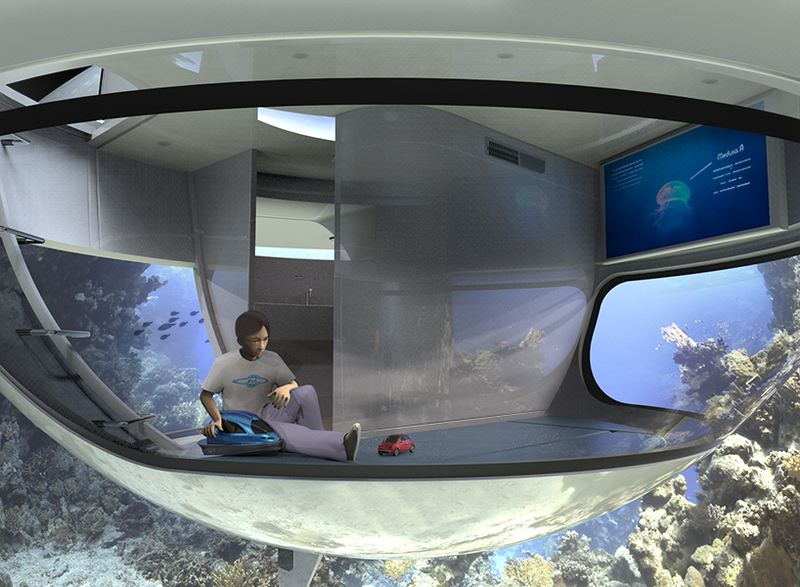 Live like the Jetsons, if the Jetsons vacationed in Atlantis. 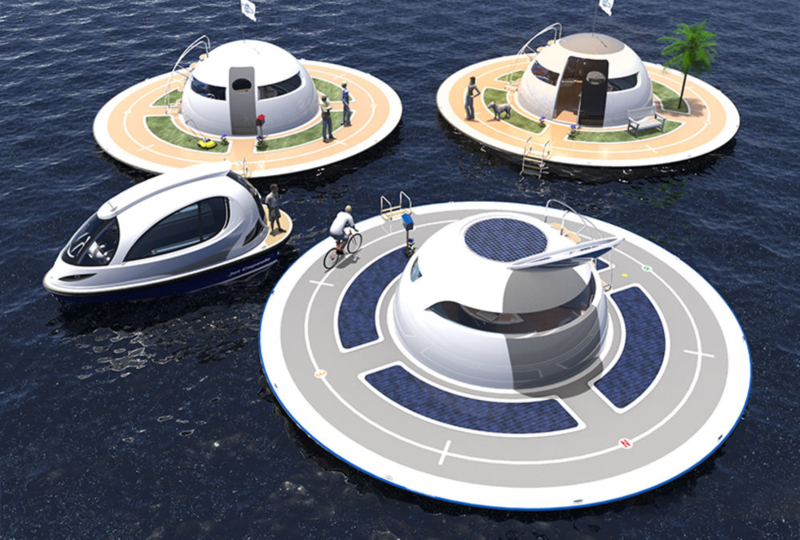 Jet Capsule has set seen the suburbs of the future, and apparently they’re shiny, eco-friendly and float in the ocean. Behold, the UFO. 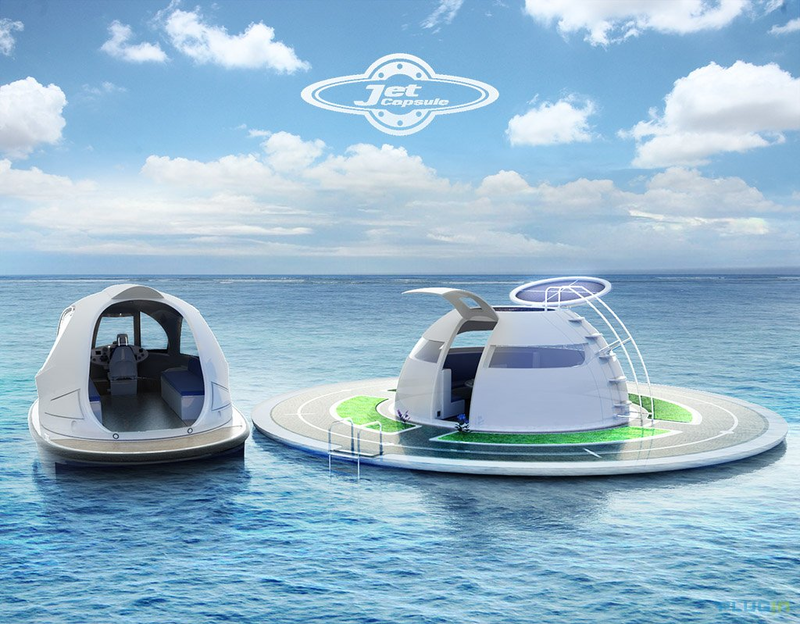 Borrowing its name from the same unexplained phenomena that inspired its flying-saucer look, the UFO (Unidentified Floating Object) is Jet Capsule’s answer to rising tides and rising land prices in coastal cities. 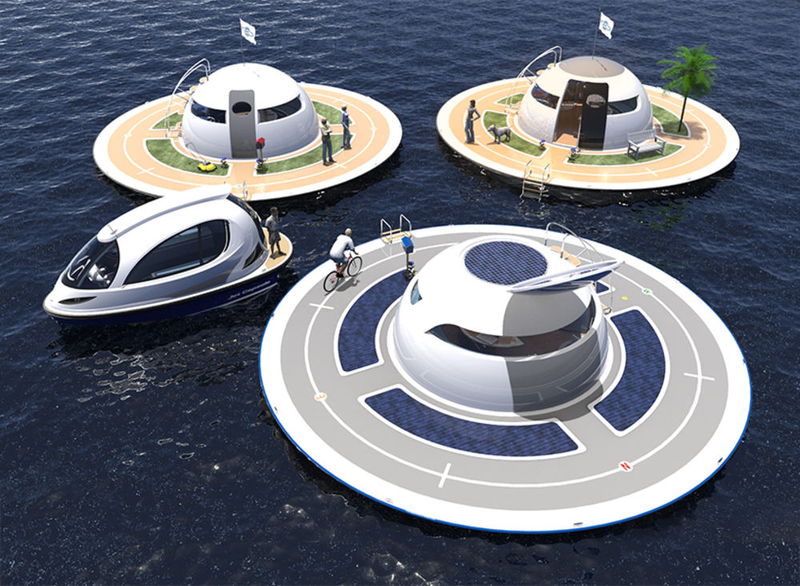 The seaborne homes are 12.5 meters in diameter, with two decks. 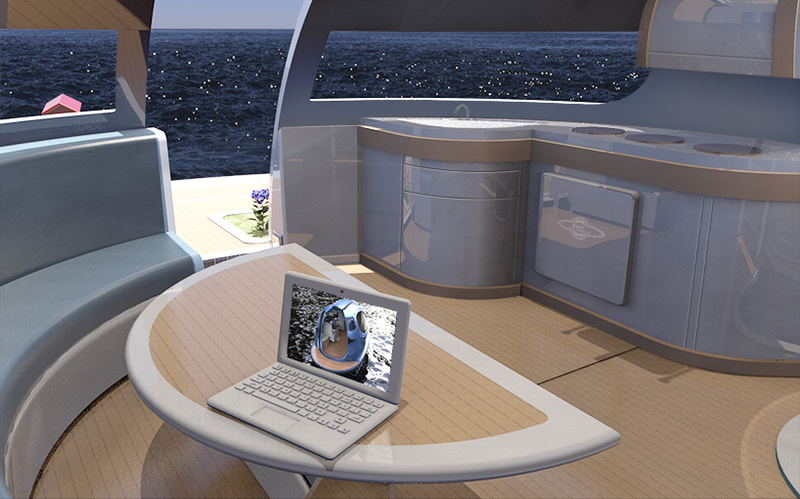 One is above water and contains a fully-functional kitchen and seating area. It’s connected by a ladder to the below-water deck, which houses the bathroom and bedroom. A height of just over 7 feet won’t leave much head room, but high ceilings are worth sacrificing in exchange for watching a breathtaking ocean sunset from your private deck. The UFO is also completely self-sufficient, boasting solar panels as well as wind and water turbines for powering the capsule’s engine and other functions. Plots on the outside disc can support a garden or other plant life and a rainwater collector and desalinator can supply inhabitants with a steady supply of fresh water. 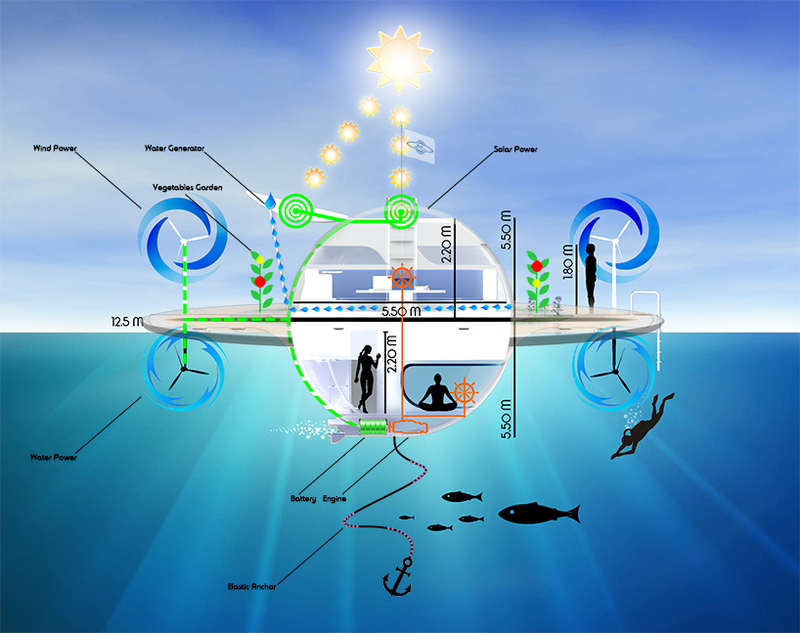 Jet capsule envisions entire communities of their capsules floating just offshore of every major coastal city. Residents could commute to the mainland via Jet Capsule’s Jet Capsule, a large, tear-drop-shaped, Jet Ski-esque vehicle. Unfortunately, UFO is still in the concept phase, but Jet Capsule is currently seeking investors to develop a prototype. So, next time you’re at the beach and you spot a glimmering dome bobbing about in the tide, it may not be a bird. It may not even be a plane. But it just might be a UFO.